A quick test for the safety of seed-placed fertilizer is to turn off the fertilizer feed for about 100 feet, mark the spot, and go back and compare stand establishment in treated and untreated areas. Canola removes more phosphate than other crops, and studies show that phosphate fertilizer rates have lagged crop removal for years. The result, says soil fertility expert Ross McKenzie, is that about 80% of Prairie fields are deficient in phosphorus. 1. With phosphorus, ultimately the form you apply is less important than the amount you apply. Crop nutrition specialist Rigas Karamanos used the graph below to show the chronic under-application of P year after year. 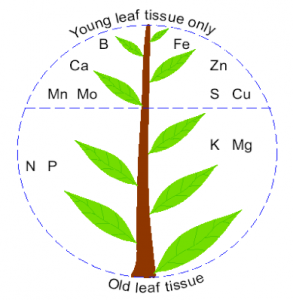 This diagram from IPNI shows where deficiency symptoms are likely to show up on a plant. Nitrogen is mobile, so with an N shortage, plants will move N to new parts of the plant. Therefore deficiency will show up first in older leaves. Are we mining soil phosphorus? 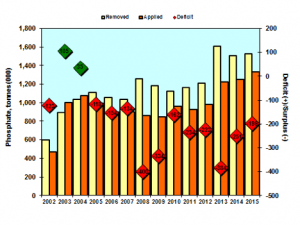 Phosphorus fertilizer rates have, pretty generally, lagged crop removal for some time. As crops remove the soluble phosphorus in the soil, the soil’s large reserve of less soluble forms will transfer some more phosphorus into the available “labile” pool. However, this labile pool may be losing its ability to keep up, resulting in a “hidden hunger” for phosphate in many crops in western Canada. 1. Apply plant available sources of nutrients. 2. Place a modest rate of P in the seedrow. At rates over 20 lb./ac., the salt component in MAP, for example, can start to set back seedling survival. 3. Place N and S in a band away from the seed. A 50-bushel crop can remove more than 50 pounds of P205 per acre. Growers using only seed-placed phosphate at a rate of 15 pounds per acre can slowly deplete the soil of phosphate. That can start to affect yield potential on the field over time. 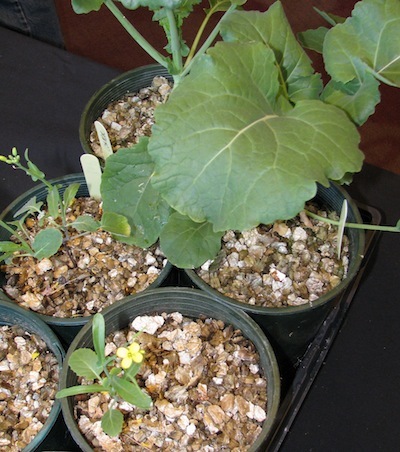 These plants, demonstrated at CanoLAB, were seeded the same day in a greenhouse and fed hydroponically to demonstrate extreme P deficiency. The potting mix has no nutrient value. The large plant received required levels of P. The tiny plants in front received no P.
When setting fertilizer rates, it helps to know your target yield and how much fertilizer canola needs per bushel of yield. Some of that will come from soil reserves and from organic matter. The rest has to be applied as fertilizer.